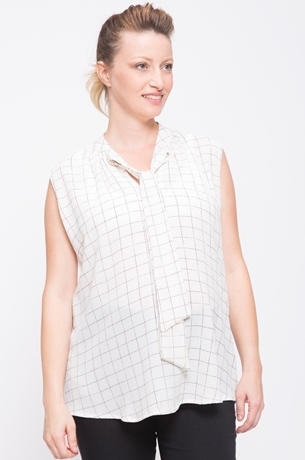 Work- to- weekend printed blouse in a light breathable fabric, with a cinched elasticized hem that sits under the bump. Scoop neck with pleats and a keyhole detail. Cap sleeves. Length from shoulder to front hem: 66 c"m / 26.84"
Sleeve length: 3c"m / 1.18"